The Scimitar is the new close assault Gear Strider manufactured by Northco, taking influence from two of the company's earlier Kodiak and Razorback gear designs. It includes climbing equipment to tackle mountainous terrain with easy and has the armor to get in close and deliver devastating close range attacks. 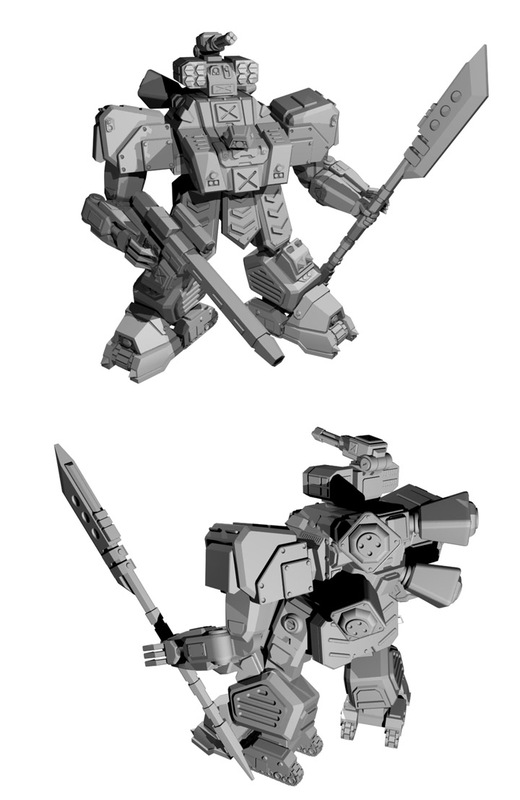 The Scimitar images below show front and rear views of the Stock loadout with DTHI Snub Cannon, Heavy Spike Guns (grappling hook climbing equipment claws) and Heavy Staff, arm mounted weapons. Plus top turret mounted Anti-Gear Missiles, Medium Anti-Aircraft Cannon and Anti-Personnel Mortar weapon systems. Other variants include the Assault Scimitar with Anti-Tank Missiles in place of the AGMs, the Command Scimitar with Sat Uplink and alternate command head, Feral Scimitar with Heavy Grenade Launcher, and the Lightning Scimitar with Heavy Pulse Laser Cannon and twin Linked Heavy Gatling Laser Cannons. The final size of the miniature will be about 68 mm tall, around the same size as the Drake and Hussar Gear Striders, it towers over gears like Hunter, which is only about 38 mm tall.